People from all crooks and corners are blessed with certain talent. All of a sudden someone spots them and soon it breaks the internet and they become famous. Once such incident is this where a tea vendor has become an internet sensation. Clearly, he is not the first tea vendor to go viral on social media - earlier, the internet's crush, Pakistani Chaiwala became a sensation and turned into a model. But this boy is ruling the internet for altogether a different reason. This guy from Kerala has some amazing bartending skills! The catch? he is a street-side stall vendor. The Tik Tok video was first shared by a Twitter user and soon the video went viral! In the video he is seen making cold coffee and he used regular vessels to give a classy touch to the drink. Let's see what luck this guy is about to come face-to-face with! This page contains news relating to various facts and events. The views are generally about current affiars and general topics in diversified areas such as political, international, national, and regional issues, sports, health, travel, lifestyle, technology and business. People having similar interets on the above topics will find this page useful. 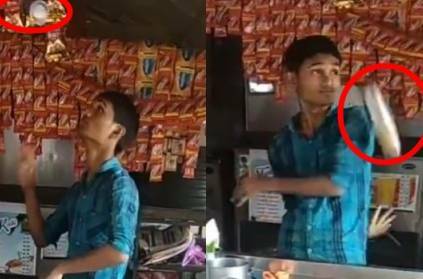 Street-side vendor becomes coolest bartender Viral video | Inspiring News.